As the year comes to it’s end and we are welcoming by new beginnings and are allowed the time to reset, we begin to think about how we would like to improve our bodies, minds and overall beings. The S is likely the most important and the most SPECIFIC. To develop this piece of the goal, you must consider the Five W’s and the H.
So rather than stating “In 2012 I want to get into shape,” you must be more SPECIFIC. I may have a very different idea of “in shape” from you, so that can take so many different meanings. When? 4 days a week. Where? At the gym down the street where I’m joining. Why? Because I’m tired of feeling uncomfortable being in a bikini around my friends. Now it’s time to add the terms of MEASUREMENT to your goal. I mean, you have to know when it is accomplished. Saying you want to look good in a bikini this year is so great, but if you have a number, it makes the goal so much more real. So perhaps getting back into that size 4 is where you want to be, or perhaps you want to have lost 15 pounds by April. That way you can count down and things become much more real when they are MEASURABLE. Once you’ve gotten this far, you must make sure that your goals are ATTAINABLE. We all may have done some pretty incredible things in our lives but save yourself the disappointment and don’t make your goal to lose all 15 pounds in 2 weeks. Even if you managed to pull that off, chances are, it wasn’t in a healthy way! So make sure these are goals that you are capable of. Rather than making the goal to get lose in right away, you want to make your goal to lose it by April, which is totally attainable! I’m going to workout at the gym down the street four times a week to lose 15 pounds by April to look and feel good in a bikini when I go to Vegas with my friends. And lastly is that TIME piece, to bring structure to your goal. Did you notice I have continuously said April is the deadline? If you are going on a cruise and want to look smokin’ hot in your bikini on April 15th, that April 15th deadline is what makes your goal TIMELY. You should also mention a date of when this starts, because otherwise, it’s easy to put off. I’m joining the gym down the street on January 1st and I will go 4 times a week until April 15th so I can lose 15 pounds and feel good about the way I look in a bikini. I’m going to run with my group 4 times a week and do yoga once a week so that on April 14th I can run the Boston Marathon in under 4:30:00. I’m going to lose 10 pounds of body fat by April 12th for my bikini competition by doing 3 days of HIIT training and 4 days of lifting weights each week so I can look great on stage. I’m going to work with a trainer once a week to increase my bench press one rep max to 135# by October 2012 because I want to be strong and lean. I’m going to lose 40 pounds by the end of 2012 by doing workouts 5 days a week and following my nutrition program every day (with 1 cheat meal a week) so I can be healthy for my family. So what’s your S.M.A.R.T. goal? Weighed in at 169lbs last night, 1.2lbs gain from episodes of overeating and lack of exercise. 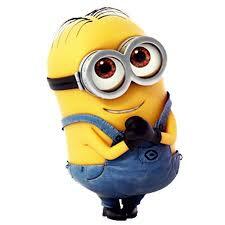 Did I tell you how much I love minions?